Communal tables In many food stalls, the tables are communal. They can seat anywhere from 2-8 people, so expect to sit near a stranger at some point. Street food A lot of the good food comes from street stalls. Even if the stalls look run down, they're fairly clean. And, the food is inexpensive, so just try a new dish! Hong Kong cafe In Chinese, "cha chan teng". This is a HK staple. They're somewhat similar to the American diner; they offer simple dishes, cooked in a homestyle way. You'll find ham and eggs on white bread, warm pineapple buns with butter, pan fried peanut butter french toast, red bean ice shakes/slushies, and, of course, Hong Kong style milk tea. Tim Ho Wan Dope char siu (BBQ pork) buns. The bun is soft and fluffy, while the top has a nice crispy topping like on a Chinese pineapple bun (similar to streusel). The brown sugar sponge cake was decent, but we were disappointed by everything else we ordered here. If you arrive before 9:30 on a work day, you probably won't have to wait in a long line. Yat Lok Restaurant Roast goose casual restaurant with a Michelin star. Their most popular item is their roast goose, which was juicy with great skin, but their char siu was very good too. There's a minimum spend when dining in, and Arthur and I wanted to share a plate (< $10), so we took it to go. Tsim Chai Kee Noodle 🍜 I thought I hated wonton noodle soup and fish balls until we had a bowl here. The noodles were springy, and soup fresh. The fish balls were the size of a toy football, and was tender and perfectly cooked. Most importantly, the wontons were humongous and flavorful. The meat was so juicy, and there was a whole shrimp tucked away inside. The wrapper was soft and thin. I was so impressed by this $6 bowl of soup. Bowrington Road Market and Cooked Food Centre This is a food court with communal seating on the top floor of a market. When you arrive at the market, there are 2 buildings, each entrance facing the other. Look up and find the little bridge that connects the building. On the side of this walkway/bridge is an arrow, pointing toward "Bowrington Road Cooked Food Centre". Go in the building that arrow is pointing at. noodle shop 🍜 We got a really great bowl of noodle soup here. It's sort of like Subway-- you pick your noodles and toppings. I can't remember the name, but we got in line because it was long. The shop is in a corner, near an exit door. Diner by St Francis This place had incredible, low-key HK cafe snacks. We had warm pineapple buns with butter, simple ham and egg sandwiches, and fresh HK milk tea. When the waitress learned that all our dads attended the primary school across the street, she gave us all fresh egg tarts and refused to accept a tip. Although I grew up in LA, this cafe had a nostalgia which made this meal seem like an old memory instead of a new event. Sang Kee Congee Shop 🍲 This was my favorite congee of the trip. The storefront is so dilapidated, you could walk by and have no idea such delicious congee would be served inside. The congee consistency was thick and smooth, despite the amount of rice inside. I normally don't like fish taste in my congee, but this fish was so fresh that I couldn't stop eating it. I'm happy to report that their business has grown, and they have another dining room on the corner of the same block. Mui Kee Congee This congee shop was in another market on the top floor. It was relatively flavorless even though it had fish. I think a little salt would have helped a lot. McDonald's The chicken wings here were so crispy! I only wish each piece had more meat. The corn pie was deep-fried? instead of baked, which made for a nice, crispy bite. KFC 🍗 I always enjoy Asian KFC, and this was no exception. The chicken was juicy and the skin was crispy. They even give you gloves so you can eat carefreely. The Portuguese tart was small but it was sweet and the crust was buttery/oily. Hong Kong Museum of History This museum has a lot of full-size displays including building replicas. I loved walking through these old Chinese buildings and imagining what my life would have been like. It would be easy to spend at least 2 hours in this exhibit. Bonus: free admission! Plaza Premium Lounge This lounge had a lot of food options and is part of the Priority Pass program (Chase Sapphire Reserve HYFR). There are 2 Plaza lounges next to each other and one was closed so we went to the lounge with the uncovered seating area. They had a chef on site, making Chinese noodle dishes, as well as many hot food options. I loved the sour gummy worms and snuck some out for the plane ride. Quinary 🍸 Very very extra cocktail bar. I got a gin-based cocktail which came with a rainbow lollipop, dried rose buds, and iced by a large cube encased in hardened candle wax. Their most popular drink is the earl grey martini, which was light. The sweetness came from the "Earl Grey caviar", which was similar to popping boba, but as also cut by the pouf of foam on top. While each drink was around $16, they are very labor intensive and creative. All of the drinks were pretty easy to drink, and even if you don't like alcohol, you might like the Quinary. We loved SOHO. It's dense with food and shops, and a wide array of people, from business people shuffling to work, to ex-pats, wandering around, discovering the city. The streets are narrow and windy, and it's easy to wander around the neighborhood and discover a new part every time. Most locals aren't in a rush. While downtown is very crowded, people don't push that much; they sort of go with the flow. 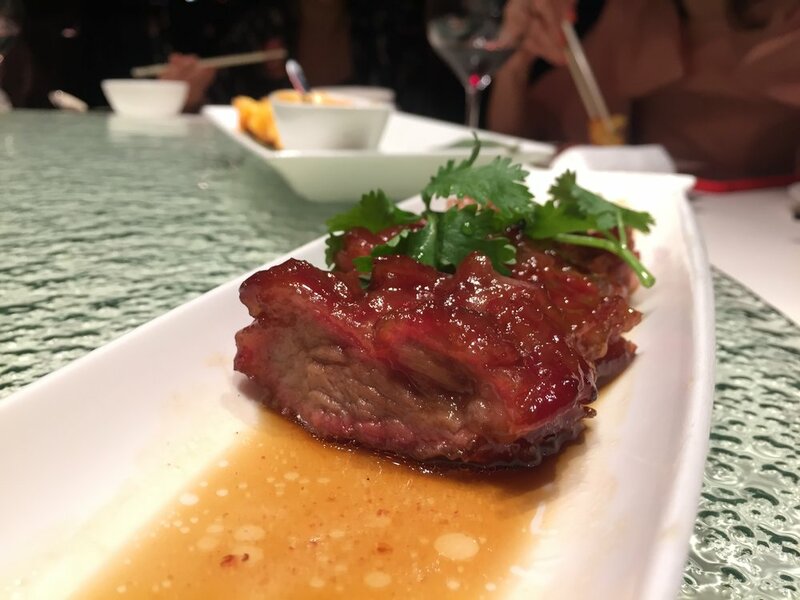 Tin Lung Heen 🍖 This restaurant had the best char siu I've ever had ever. In fact, this was my favorite single item of the entire trip. It was so thick, juicy, and tender. Each piece was bursting with the Asian flavors I grew up with. I will never forget this dish. Yardbird This meal surprised me the most. It was like a Japanese-Chinese restaurant you'd find in SF: very bougie and Westernized. But everything we ordered was just cooked so well. The duck liver mouse was so rich, but balanced by the brick toast. The BBQ chicken skewers were juicy and had a Asian-American flavor. The fried cauliflower was like American sweet and sour pork. I enjoyed all of it. Before you leave, they give you a little bag of their special dry seasoning, but we bought 2 little bottles too because its flavor was so bright and unique. Sohofama Surprisingly good Western-Chinese food. We met up with our vegetarian friend here and there were enough options to satisfy us all. My favorite dish was mapo tofu, which reminded me of a dish my mom would make. Tea Wood Taiwanese-HK fusion. We really liked the beef noodle soup with thick and chewy noodles. It wasn't as spicy as Taiwanese soup, but there were large chunks of carrots in there, which is very common in Hong Kong cooking. The desserts included fancy brick toast and grass jelly with red bean. The Dining Room HK cafe with Shanghainese food. This was my second least favorite meal in HK. The XLB skin was too thick, wasn't very soupy, and tasted like tire rubber. Their SJB bun was too mushy too. They also charge for tea, so decline it when you sit down if you don't want tea. Crystal Jade Another disappointing meal. The XLB skin was too thick and the wonton soup wasn't salty enough. The Shanghai thick noodles were the worst: they were overcooked and too soft, and also missing saltiness. We came here because the Crystal Jade in SF is pricey, but we didn't save that much money here. Hanjuku Kobo 🥧 Incredible cheese tarts. This tart is similar to the egg tart but has a cream cheese flavor. This particular tart was creamy and smooth, and filled a flaky, buttery, cookie crust. This was definitely in my top 5 foods of HK. Tai Cheong Bakery 🥧 This bake shop had many cookies and crisps, but it didn't look like an egg tart place, but boy were these egg tarts good! 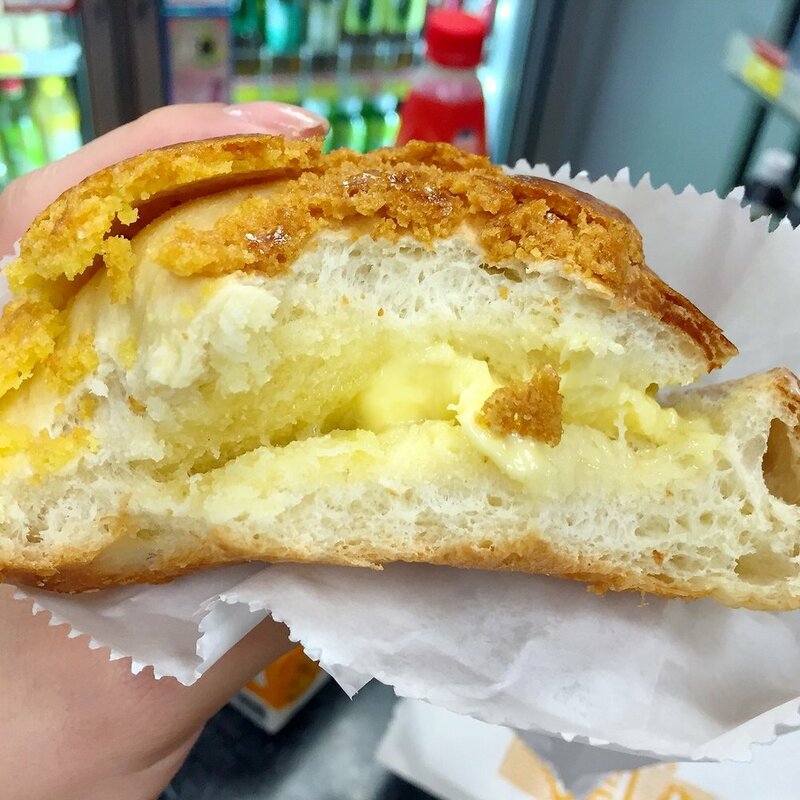 The custard was the softest of all the egg tarts we ate, and the crust had a buttery flake. I'm definitely going to return here. Oddies Bougie egg waffles. I got the plain/regular flavor. The outside was nice and crispy, but this was one of the pricier egg waffles we saw. TP Tea Taiwanese boba shop by the creators of Chun Shui Tang, the supposed creators of boba. Their boba is medium-sized and the tea is fragrant. Arthur went 3 or 4 times. Lan Fong Yuen My ideal HK milk tea. The overall texture was so silky! The tea is strong but not overpowered by condensed milk. You can order milk tea to go, and we went at least 4 times. Bao Yam Li Din Street bao vendor. Bun is fine, bean filling was fine. Dream Tofu The black sesame mochi balls were SO soft! The black sesame filling was dense with flavor and gushed everywhere. The tofu was soft and silky, and I enjoyed the ginger syrup even though I normally don't like ginger in my "tofu flower". This shop is small and has about 4 counter seats.